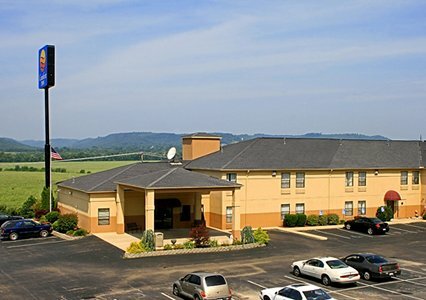 Location/ Directions: I-64 Exit 179, Route 67 North to Route 23 North; Hotel is 4 miles north of US 52 and US 23 on right. About Hotel: 2-Floors, 61-Rooms, Interior Corridors, Elevator, Bus & Truck Parking, Cold Weather Hook-up, Fitness Center, Free Newspaper Mon-Fri, Guest Laundry, Indoor Heated Pool, Outdoor Parking, Pet-friendly Hotel (fee), Speaker Phone, Free Hot Breakfast, Cable/Satellite TV, Free Local Calls, Free Wireless High Speed Internet Access, Hair Dryer, In-Room Coffee Maker, In-Room Desk, Individual A/C & Heat, Iron & Ironing Board, Microwave, Refrigerator, Voice Mail, Wake-Up Service. Railroad View: Excellent View! Any room on the US-23 side of the motel will offer a railroad view. The railroad is just across US-23. Notes: This is a former Holiday Inn Express motel. Photo Comment: The Google Street image looks north down US-23. The Comfort Inn motel is seen on the left (pictured as a Holiday Inn Express, its former brand name). The railroad can be seen along the road to the left. The double track main is part of Norfolk Southern's Lake Division. Location/ Directions: On US-23 just north of downtown Portsmouth. About Hotel: 3-Floors, 51-Rooms, Interior Corridors, Barbecue Grill, Elevator, Vending Machines, Indoor Heated Pool, Spa, High Speed Internet Access, Bus/Truck Parking, Outdoor Parking, Business Center, Pets Allowed (fee), Air Conditioning, Alarm Clock, Desk, Newspaper. Railroad View: Excellent View! Any room on the US-23 side of the motel (front) will offer a clear railroad view. 2nd and 3rd floor rooms will keep you above the parking lot. Location/ Directions: Located right on US Highway 23, just North of the Portsmouth city limits. About Hotel: 2-Floors, 63-Rooms, Interior Corridors, Fitness Center, Free Parking, Pets Allowed. Railroad View: Good View. Any room on the west side (US-23 side) of the motel will offer a railroad view. Notes: This is a former Days Inn motel.